In 1948, World War II had given way to an uneasy peace a “Cold War,” as presidential adviser Bernard Baruch so aptly named the new climate of international tension. The year also witnessed the death of baseball legend Babe Ruth, the birth of the State of Israel and with his presidential election upset of Thomas E. Dewey, a new lease on life in the White House for Harry Truman. In 1948, an important change took place in U.S. coinage as well, when the Franklin half dollar made its debut. Its introduction completed the conversion of U.S. coin designs from allegorical figures to portraits of famous Americans. It also rang down the curtain on an era that many regard as the golden age of U.S. coinage art. The Walking Liberty half dollar, last struck in 1947, was the final precious-metal coin remaining in production from the early 20th-century period that spawned the “Mercury” dime, Standing Liberty quarter and Saint-Gaudens double eagle. Mint Director Nellie Tayloe Ross had contemplated a coin honoring Benjamin Franklin ever since seeing a U.S. Mint medal prepared in Franklin’s honor in 1933 by John R. Sinnock, the Mint’s chief sculptor-engraver. 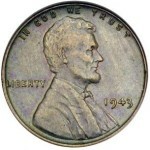 Evidence suggests that Ross might have made the change in the early 1940s, when the half dollar’s design, used for the statutory minimum of 25 years, became eligible for replacement. Although escalating production demands occasioned by World War II postponed Ross’ plans, she showed her enthusiasm for the project by directing Sinnock to design a Franklin coin on a contingency basis. It would be hard to fault Director Ross for her choice of Ben Franklin as a U.S. coinage subject. Of all the Founding Fathers, Franklin very likely enjoyed the greatest stature among his contemporaries, not only in this country but also abroad. He was justly renowned as a printer, publisher, author, inventor, scientist and diplomat, and he played a pivotal role in helping the colonies gain their independence by securing vital aid from France. In a speech at the unveiling of the Franklin half dollar, Ross recalled that people had urged her to place Franklin’s portrait on the cent because he was identified so closely with the maxim “A penny saved is twopence clear” (often misquoted as “A penny saved is a penny earned”). Ross explained her choice of the half dollar: “You will agree, I believe, that the fifty-cent piece, being larger and of silver, lends itself much better to the production of an impressive effect,” she declared. Sinnock’s portrait of Franklin, modeled after a bust by 18th-century sculptor Jean-Antoine Houdon, is bold and clean, contrasting sharply with the subtle, detailed depiction of Miss Liberty on the Walking Liberty coin it replaced. LIBERTY is inscribed above the right-facing portrait, IN GOD WE TRUST below and the date to Franklin’s right. Tucked below Franklin’s shoulder are Sinnock’s initials, JRS. The Liberty Bell on the reverse made sense as a complement to Franklin, since both have become closely identified not only with the nation’s birth but also with the city of Philadelphia. 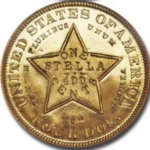 Three inscriptions are arranged around the bell in the same sans serif style used on the obverse: UNITED STATES OF AMERICA is above, HALF DOLLAR below and E PLURIBUS UNUM, in much smaller letters, to the left. To the right of the bell is a puny-looking eagle. 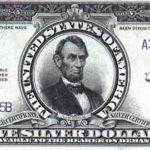 This had been required by law on the half dollar since 1792 and was reaffirmed by the Coinage Act of 1873, which mandated the placement of an eagle on every U.S. silver coin larger than the dime. The eagle was added by Gilroy Roberts, who completed work on the coin following Sinnock’s death in 1947. Understandably, the federal Commission of Fine Arts (an advisory body) took issue with the eagle’s size, but oddly enough, they disapproved of displaying the crack in the Liberty Bell, arguing that “to show this might lead to puns and to statements derogatory to United States coinage.” Although the Commission recommended a design competition, the Treasury Department approved Sinnock’s models without change. Years later, Sinnock was accused of modeling his version of the Liberty Bell, without proper credit, on a sketch by artist John Frederick Lewis. The pilfering first occurred in 1926, when Sinnock apparently used the sketch in fashioning his design for the commemorative half dollar marking the sesquicentennial of U.S. independence. His Franklin half dollar reverse design was patterned, in turn, on that earlier work. Numismatic reference books now credit Lewis belatedly for his role. Although Franklin half dollar mintages were modest by modern-day standards, the series contains no issues that are particularly rare. The production low point came in 1953, when the Philadelphia Mint struck just under 2.8 million examples; the peak occurred in 1963, when the Denver Mint made just over 67 million. 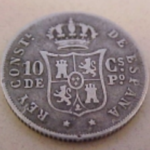 Franklin halves also were minted in San Francisco. On branch-mint issues, the D or S mintmark appears above the bell on the reverse. Total mintage for the series, including proofs, was almost 498 million coins. Because they are so plentiful, in circulated condition most Franklin halves bring little or no premium above their bullion value. A number of dates are elusive, however, in the higher mint-state grades, especially with fully defined “bell lines” near the Liberty Bell’s bottom. Although the relatively low mintage 1949-D and 1950-D issues are considered “key” dates in the series, some coins with higher mintages, while common in lower grades, also command impressive premiums in Mint State-65 and above. These coins routinely came with weak strikes, and the scarcity of “gems” is compounded by the fact that few were carefully saved. Dates in this category include 1960-D, 1961-P and D and 1962-P and D. Proofs were issued every year from 1950 through 1963 as part of annual proof sets: over 15.8 million were made. Small numbers of proofs were struck with cameo contrast, an attractive frosted surface on the devices contrasted with a polished mirror-like appearance in the fields. These cameo coins can bring substantial premiums over the prices of ordinary proofs without such contrast. A full set of Franklin halves consists of 35 different business strikes and 14 different proofs. 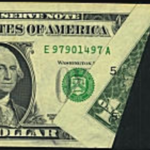 Because it is so compact and easily affordable in less-than-pristine grades, the series is widely collected by date and mint. Those with deeper pockets who love a challenge seek to assemble date-and-mint sets in MS-65 and above or collections of high-grade proof Franklins with deep cameo contrast. Points on the design to first show wear are Franklin’s cheek, shoulder and hair behind the ear and the lettering and lines on the Liberty Bell. Franklin half dollars were made for just 16 years. 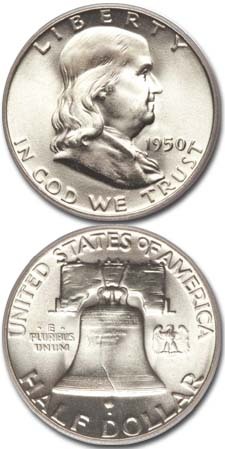 The series was cut short at the end of 1963, when John F. Kennedy’s shocking assassination led to the creation of a new half dollar memorializing the martyred president. Where can I get a $500 bill?